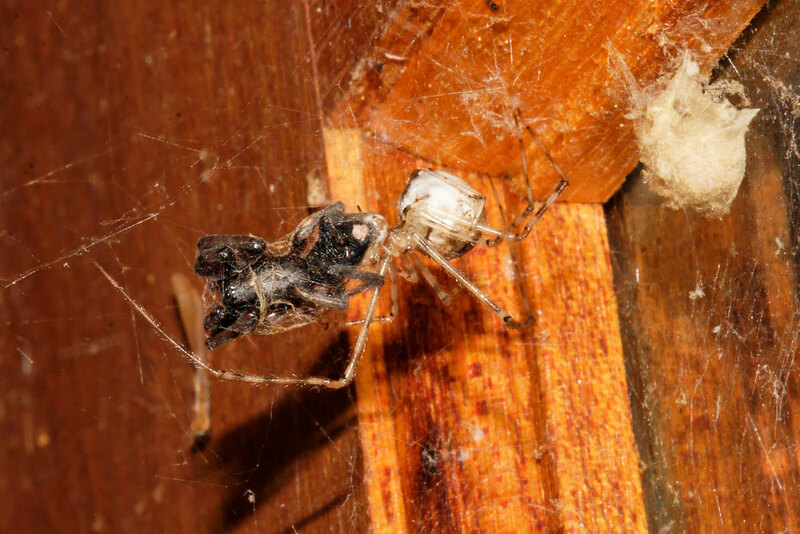 This is all about the little spider who is almost everywhere on houses around the world, and often goes unnoticed. But once you find them, they are so very good to watch, because there is nothing hidden. They are sometimes called the American house spider, or the common house spider, and are introduced into Australia. Achaearanea species are small spiders in the Theridiid family - that is the big family which includes the black widows and redbacks. 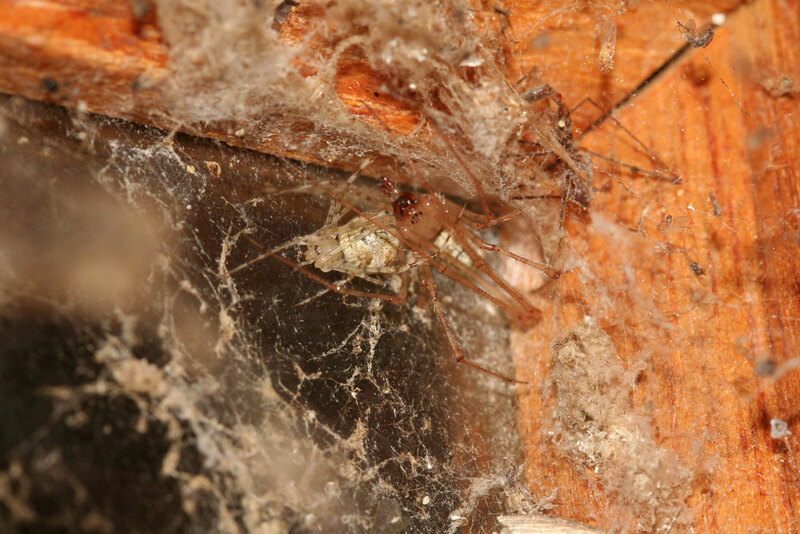 All theridiids tend to have the big abdomen and tiny cephalothorax. Achaearanea are totally harmless. (Click on images to get a bigger version). 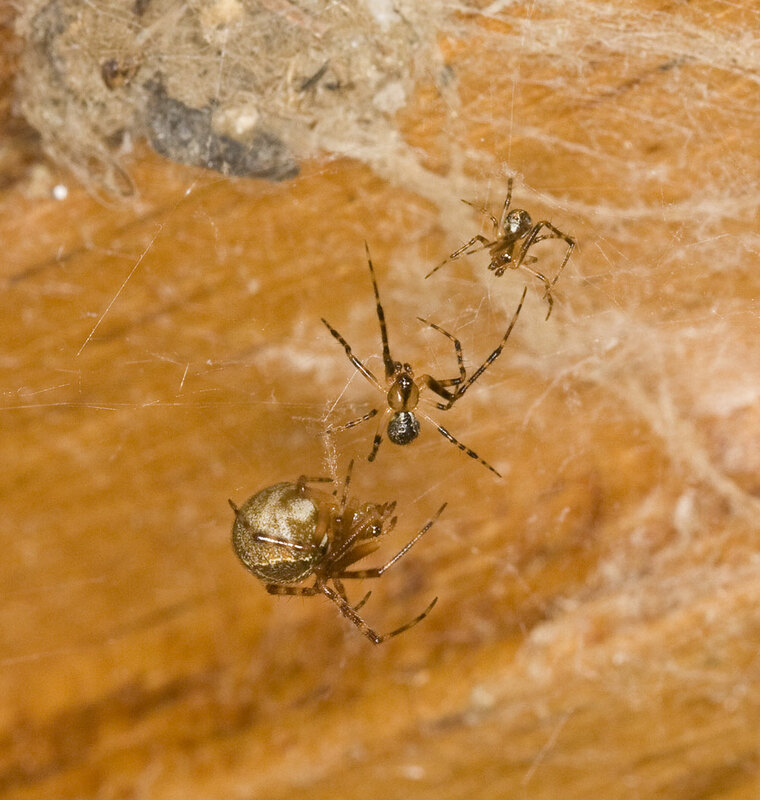 The webs are messy cobwebs, so it usually looks like a messy, unused web, until you look closely and see the pale owner. A strong torch, even during the day, helps a lot. 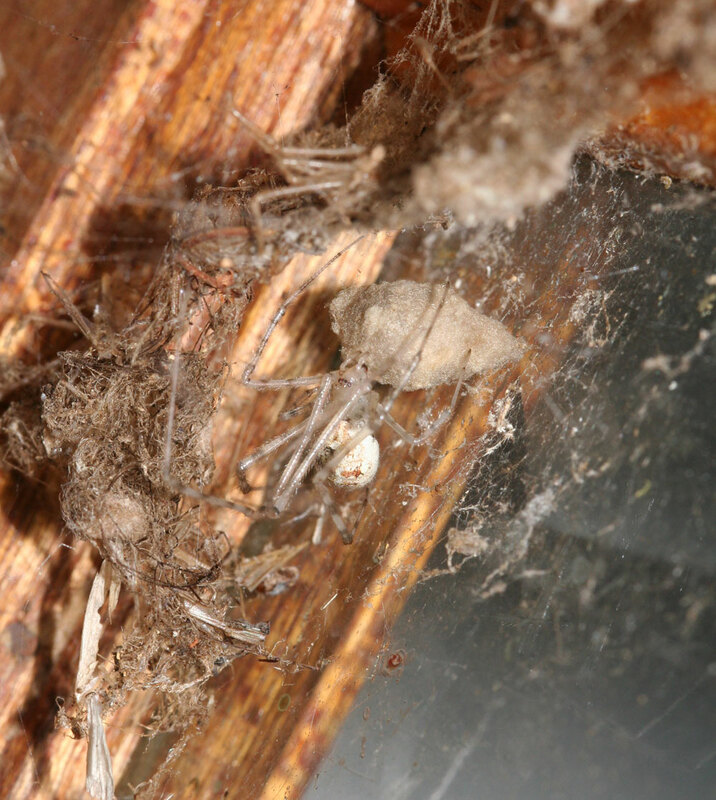 The female will build a messy egg sac, hanging it in her web. And then they hatch. Great to watch - and the babies stay around for a week or more. 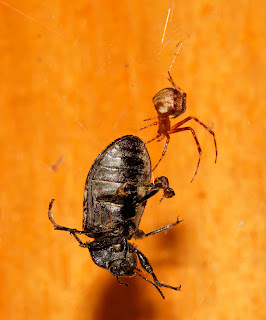 and a massive (on small spider scale) beetle. All you have to do to see them is leave the messy webs alone. They are everywhere! 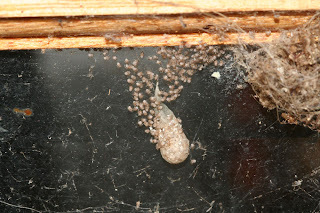 Great writeup and photos -- I especially like the last picture and the one with the spiderlings. So good to meet you - well, sort of meet you. I have just spent an hour thoroughly enjoying your blog. Really interesting writing and fantastic photography. I am drop dead jealous that you have hummingbirds. You live in Arizona. I visited the southwest late 2009 as part of my research for my doctorate. In particular, I went to to Chaco Canyon. I fell in love with the place, and can't wait to get back. The desert colours, clarity of the air and sky, incredible ruins ... I could go on and on. I didn't see much of the wildlife. I allowed far too little time and was focused on the archaeology and Pueblo culture. To be totally honest - I had no idea it would be so incredible, and just allowed enough time to get done what I had to do. Foolish me! Is there some reason you guys keep it such a secret? I saw tarantula burrows, but none of the gorgeous creatures themselves.